Television was still in its infancy in the 1950s but a number of quiz shows were popular with viewers, including The $64,000 Question, The $64,000 Challenge, Twenty-One and High Finance. For some time rumours had circulated that not all was well with the shows and that some had been fixed. The District Attorney of New York and a subcommittee of the House of Representatives set out to investigate. 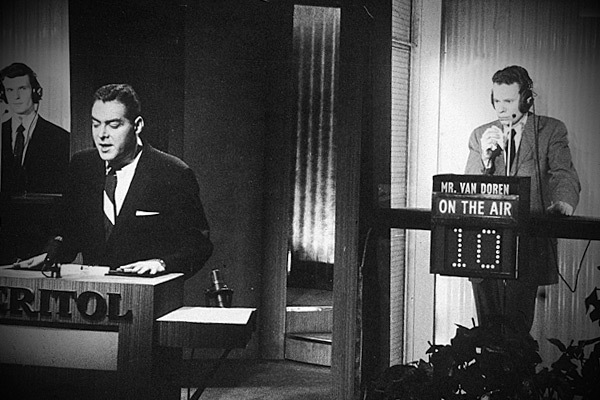 The highest ratings shows in 1955 were The $64,000 Question and The $64,000 Challenge but when a good-looking young man called Charles Van Doren began appearing on Twenty-One on 28 November 1956, that show’s ratings began to rise. Van Doren was the scion of a literary family and he was up against the nerdish Herbert Stempel. The two battled out for several weeks until Van Doren finally beat Stempel. He had banked $129,000 on 14 shows before he lost to Vivienne Nearing on 11 March 1957. Van Doren was then hired at $1,000 a week to present Today on NBC as a stand-in for David Garroway and offered a three-year contract. On 11 February 1957 he appeared on the cover of Time. In August 1958 Van Doren was an English professor at Columbia University when Herbert Stempel went public with a claim that the show had been fixed. Van Doren emphatically denied the allegation. In January 1959, Frank Hogan, District Attorney of New York, convened a grand jury and called witnesses. Van Doren again denied all claims, as did other witnesses. Then the Special Subcommittee on Legislative Oversight of the House of Representatives also called witnesses. NBC urged Van Doren to appear but he dropped out of public view for ten days. When he reappeared he travelled to Washington DC and on 2 November 1959 appeared before the committee whose chairman was Arkansas Democrat Oren Harris and confessed that “I have deceived my friends and I had millions of them.” Van Doren revealed that he had finally begged the producers to let him lose because of the pressure he was under, winning each week. NBC fired Van Doren and he was allowed to resign from Columbia University. However, his literary career flourished and he wrote several books. Now-Van Doren is in his 80s and adjunct professor at the University of Connecticut. Although his infamy stems from Twenty-One, Van Doren was originally asked to appear on Tic-Tac-Dough.